Players control the water guns to shoot at targets above and below water to win related tickets award. Complete levels and get props to enter the big shower gun mode. - insert coin and players select a level, and the game begins. 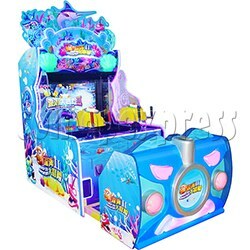 - player controlling the water shooting gun to protect the fish, shoot at the sea monsters to get score. - the game can get props, reach the conditions will switch shower gun.